Viewing topic "Logic8/9 and Motif XF HELP"
is not easier than the software allows the motif using the program change on all midi channels and banks run by the sounds of the motif Logic? each operation and open studio manager and then save motif saves and saves logic? it’s crazy, if yamaha does not solve the problem I change Motif xfe peace. I would use the sounds of banks 1 through 8 with the Kurzweil K2600 as freely as it does not seem that complicated noo? If someone else who can help me is very welcome. Hello, first… please do not double post it only confuses the matter of getting you an answer. How are you connected? Via USB? And are you attempting to use Studio Manager to change the Motif XF’s voices (recommended), Logic, or both? If possible, can you attach a pic of Logic’s Library with the XF connected showing your MIDI ports and MIDI channel assignment? Intel MacPro is connected to USB, I have not the card because FW yamaha motif xf reflection and see if it is compatible to work with Logic. Motif is what I ask - as I create the setup in Logic does not match the sound that I wonder? how do I? the PC I have always and only the GM sounds? and I have to do all the setup of the song only sounds gm, which I did not need because it is not true. I hope to explain everything well. In Logic, forget about the GM Port in the library- do not use it. 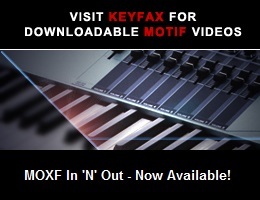 Via USB, Logic utilizes your Yamaha Motif XF Port #1 to address the XF’s tone generator. Select both the Port and the MIDI Channel. In the photo of your library, you selected the XF’s port but not the MIDI Channel. That’s why, in the inspector, the track still reads ‘GM Device 1’. Logic Project No. 1 song sound module, and key motif’s sequencer Logic Ok? capisci perchè insisto nella ricerca di una soluzione del motif xf per dialogare con logic? I apologize but, I’m still not quite following what it is that you are trying to do. 1) Do you want to use the Studio Manager to change voices? do not use studio manager, the motif xf is connected USB cable to your Mac Pro and the card’s audio output motif Saffire pro40. I now have the program changes from Logic contol of the motif xf, everything works perfect. Logic project with the name unless I need for future work. this is all midi, to record and listen to my work.